Frankfurt/Singapore: Lawmakers in the US continued to bicker late Friday evening (India time) over the $700 billion (Rs32 trillion) bailout package that seeks to rescue and revive the country’s financial system, after their failure to agree on the plan Thursday sent global stocks sharply lower on Friday, weakened the dollar, and put money markets under massive stress. In an address to the nation Friday morning (late evening India time), US President George W. Bush said he is confident the plan would pass. On Thursday, a group of Republicans suggested an alternative to the White House’s $700 billion bailout plan. Asian and European markets closed or were trading in the red on Friday before the discussion restarted. Sensex, the benchmark index of the Bombay Stock Exchange, lost 445 points, or 3.28%, from its previous close to end at 13,102.18. London’s FTSE-100 Index fell more than 90 points, or 1.8%, in early trades. The Dow Jones Industrial Average fell about 1.4% to 10,868.82 points shortly after opening Friday morning and was trading at 10,949.74, down 0.66%, at 8.45pm India time. “It’s all about ongoing concerns about the banking crisis and where it’s going to end," said Padhraic Garvey, head of investment grade strategy at ING in Amsterdam. On Friday, the US Federal Reserve launched a new effort with other central banks to keep money markets alive. Central banks added $13 billion to an exceptional fund that provides the US currency to European banks, bringing the total made available thus far to $290 billion. But analysts sounded the alarm over extreme tension in the money markets used by banks for short-term funding, with one saying they had surpassed “apocalyptical" levels seen last week. According to a joint statement, the central banks of the eurozone, Britain and Switzerland alongside the Federal Reserve launched operations to pump more dollars into the markets for banks to borrow in one-week loans. “These operations are intended to address funding pressures over (the) quarter-end," the joint statement said. Commercial banks typically seek extra funds at the end of each quarter to help them balance their books but credit has all but dried up in the current market turmoil, creating huge liquidity problems. 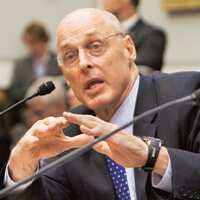 The $700 billion bailout package was proposed by US treasury secretary Henry Paulson as the solution to a financial crisis that began last year with issues related to risky mortgages and has had an extended climax over the past few weeks that have seen the collapse of several Wall Street firms with the latest being that of Washington Mutual Inc. (WaMu) on Thursday. Earlier on Friday, Indian stocks fell with banks and IT firms leading the decline. The fall in Indian markets this year has been driven by foreign institutional investors who had, until 24 September, taken out $8.89 billion from Indian equities (net of whatever they bought). That trend, and slowing capital inflows into India, could hurt the Indian rupee which has already depreciated by around 15.2% since the beginning of the year. Slowing capital inflows into emerging markets because of risk aversion will hit India’s rupee the most, Stephen Jen, head of currency strategy at Morgan Stanley in London wrote in a Thursday report, because the country depends on “footloose" short-term inflows. Simon Sturdee is with AFP and Patricia Lui is with Bloomberg. Reuters’ London correspondent Jeremy Gaunt contributed to this story.